You and the family are going to have fun on your camping trip. There will be lots of running, chasing, swimming, exploring, and starting campfires. Some of you may end up with bumps, bruises, slivers, bug bites, or maybe a few other minor insults that threaten the fun of your vacation. If you have a well stocked first aid kit on hand you can quickly treat the problem and get back to having fun. You’ll need several things to protect your skin. 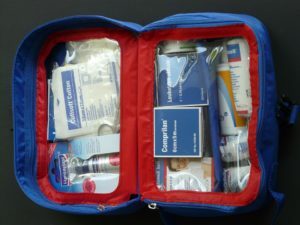 You first aid kit should have antibiotic cream, hydrocortisone cream, calamine lotion, bandaids, gauze pads, ace bandages, cold packs, peroxide, and tape. Pack Q-Tips, a small pair of scissors, tweezers, nail clippers, and a magnifying glass. You might also want lip balm, sunscreen, an eye wash cup and saline solution. For tummy troubles, allergies, and cold symptoms you can stock Malox, Tums, Pepto Bismol, Cold medicine, Benadryl, cough syrup, and pain reliever. You should also be sure to pack your own prescriptions and make sure you have enough for the time you will be camping. If your pets have prescriptions do the same for theirs. It’s also a good idea to bring their shot records with you, just in case you have to make a trip to the vet while you are away from home. We hope you won’t need any of these items but also hope you’ll have them if you do. Once the injury is tended to you can get right back to enjoying your long awaited vacation.